two years ago, wasn't he? Three years ago, we'd known each other fewer than two months, were engaged, and were less than a month away from getting married. I spent Mr. T's birthday sick as a dog on his couch, with him making me chicken soup and honey-lemon-ginger drinks by the gallon. His thoughts on the experience of me being sick on his birthday, "Love is not caring about snot." Two years ago, we celebrated twice, once at our favorite restaurant in Israel, Bodega (yes, there's now Mexican food in Israel) in Efrat, sparklers and all. Then I made his favorite soup, Salmon Chowder, and a chocolate cake for his birthday at home. One year ago, he was a million miles away and we spent his birthday apart. I sent a card, and I think I sent a Metal Earth for him to build (he loves those things), but it was just another lonely day apart. This year, I gave him the most hilarious of books, and he's going to spend the morning checking the eruv, the late morning and early afternoon doing some work on someone's house, and then going into the deli for the evening. It's not perfect, and we won't see much of each other, but it's better than a million miles. Happy birthday to the kindest, most genuine, and most giving person I've ever known. Mr. T would bend over backwards to find a way to help someone -- emotionally, financially, you name it. And I'm happy to report that Asher is following 100 percent in his father's footsteps, and I couldn't be more proud. Here's to as many more as we can manage, Mr. T.
Some great questions rolling in, and I'm so glad I get to answer them. Let's start with what might seem like a tough question, but one that actually has a pretty simple answer. Hi Chaviva! My question is how would you handle a situation where Ash decides to be less religious or non-religious? I wonder because you fought so hard to become Jewish, so I can imagine that it would be a really sensitive situation for you. Would you accept him if he was not religious? Or mourn him? 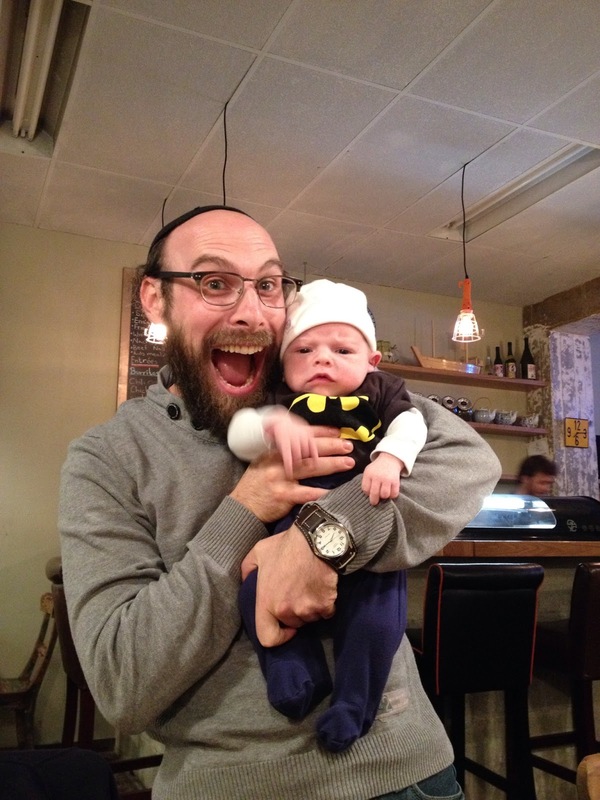 How would you try to bring him back to Judaism? Once upon a time, after a very difficult marriage and divorce, I was left spinning, unsure who I was or what life was meant to look like. During that time, I made some questionable choices and ended up dating someone who was not Jewish (this was a few years after my Orthodox conversion, so I was, for all intents and purposes, a Jew). When it was revealed that I was dating a non-Jew (while still keeping kosher and Shabbat), I received hate mail, calls for my conversion to be revoked, comments on blog posts saying that I was the "worst thing to happen to Judaism," and harassment from people who had once been friends (mostly other converts, too). I was being pushed and shoved away from the Judaism that had so nurtured my soul and given me a home. I was being told I was not a Jew, I was being distanced from my family. But there were, during this time, a few (religious) friends who pulled me close. They sent me notes, they checked in on me, they reminded me that I had a home, that I was loved and that Judaism was not rejecting me. They gave me the nurturing and love that I needed to make the right decisions at the right time, and they allowed me to return. I really learned who my real friends and family were in Judaism, and I learned who was toxic and insincere. What this taught me, this entire experience that still hurts and stings to this day, is that Judaism teaches us that when someone strays or makes choices that don't necessarily jibe with Torah Judaism, we pull them close, we give them a space. If you push them away, they'll just move farther and farther away until they're lost in the crowd. The often-quoted adage is "hate the sin, not the sinner," and those who truly understand Judaism and HaShem hold tightly to that dictum. So, long story short ... I grew up not Jewish and found my way here. Mr. T grew up fairly Jewish, attending a Jewish day school and then a boys school and then had some wild and crazy teen years before returning in his early 20s. We've both lived our lives and experienced things that those who are FFB (frum from birth) perhaps not, and that gives us a unique perspective. Sure, I'd love for all of my kids to be as religious as us, but there's always the possibility that they'll be more or less observant than us, and I'm okay with that. Judaism is a journey, and as long as I do my job and give my kids a healthy view of Judaism and the outside world, they'll choose what is right for them and I'll respect that. I'll hold them close, give them a nurturing environment where they know that they are loved for who they are, no matter the choices they make. They will always have a home. Thank you for admitting that you seeked marriage counseling! Did you and your ex-husband ever go through counseling? How was that experience different? I've been reading for years but I guess I still don't understand why you got divorced. It worked out for the best obviously but I can't help but be curious since it seems rarely discussed in the Orthodox world. I've actually written about it before, I'm pretty sure. I was much less open during my last marriage. All of our struggles and trials were kept quiet and out of the public eye, contrary to how I live much of my life. My in-laws were shocked, absolutely no one knew it was coming because darn if we weren't good at putting up appearances. I was depressed, anxious, and embarrassed that it wasn't working, but I managed a smile when I needed to. Of the 16 months we were married, we spent a year of that in couples counseling, with me in additional counseling on the side. Despite that, it just wasn't meant to be. 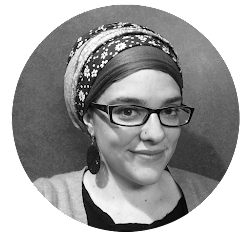 It took a meeting with a rabbi, who posed an ultimatum to my ex. When he responded with "I'd like to think I'd choose my marriage," I knew it was done. I had to make the decision, and I did. Believe it or not, divorce is actively encouraged in the Jewish community (in the Orthodox world anyway), because if things aren't working out (for any number of reasons), both individuals have the right to move on and give it another go. There are even discussions about how one merits a series of partners (read about it: A Zivug or Bashert?). Hope this provides some semblance of clarity! 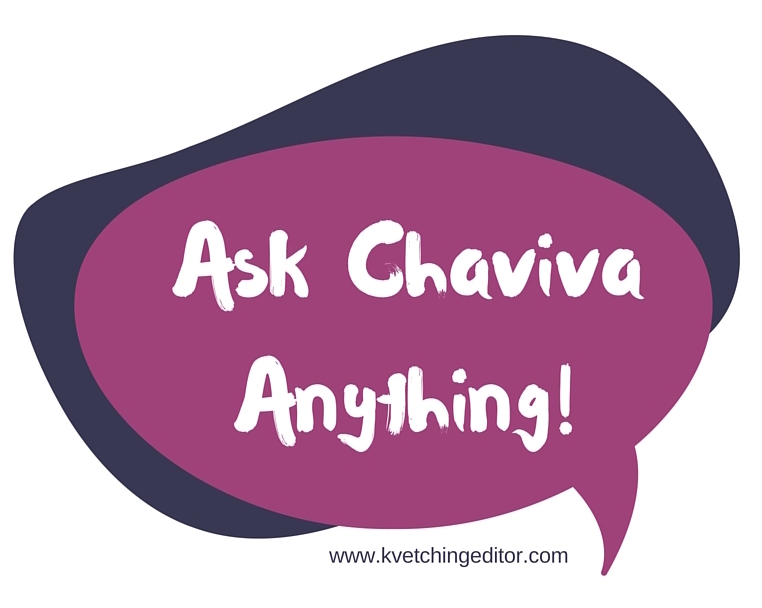 Ask Chaviva Anything: Reunited, but How Did It Work? So I've received two questions after re-opening one of my favorite features. The first question was "How often do you poo?" and the answer is, I'm pregnant. What do you think? Not enough! Now for the serious question, and this is a really amazing question, so thank you to the asker! Hi Chaviva, you never wrote how you worked things out with Mr T, after being apart for so long. You have a baby coming, so you've clearly (probably?) found each other again, but it couldn't have been easy. So did you just let it happen, or did you take some conscious steps? Couple's therapy? I'm really interested because I'm currently in a long-distance relationship and a bit apprehensive (though excited) about living finally together. The interesting thing about this question is that I thought a lot more about this while Mr. T was gone than when he actually got back. We talked a lot about how hard it was going to be, and despite the fact that things were seamlessly easy the two times we saw each other in person during those nine months, they were just visits. When you don't live with someone for a month, or two months, or nine months, you get into a flow. 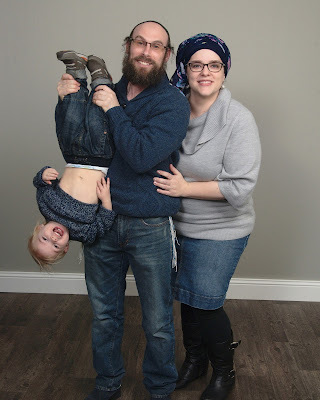 Asher and I had a very firm schedule, our day ran like clockwork and I knew that I was responsible for all of the household chores, cooking, and I didn't have the misconception that someone else was going to show up so I could ask them to help. It was all on me, and I got good at taking care of a toddler and running the house and working full time. My home was a well-oiled machine. Being that my personality is very "I am a rock, I am an island," this was a very dangerous place for me to be. It took me a long time to warm up to asking for help, and meaning it, and accepting it, with Mr. T. So to fall out of that role and back into the "I'm doing it all myself, I don't need anyone" role created an environment that was not at all easy for Mr. T to walk back into. But when he got back, he needed to be needed, because he'd been gone so long, didn't have a job right away, and so on. Family photos over the weekend. They make it fun. I don't think anyone can just let it happen. I tried really hard to think that letting it happen was the best way, but even though that worked for the first month, it got really hard after that. The conscious steps were necessary. He's been back a little over six months and we're still working on this. So I really had to force myself to ask for help, to stop doing everything myself, to need someone else. But it hasn't been easy. We've had a bit of counseling, and it was the good kind of "smack you in the face, you have to stop thinking he's a mind reader" kind of counseling. Also, I had to really let go of the parenting side of things. It had been just me and Ash for nine months, and in those nine months he was eating like a normal person, growing teeth, learning to walk, starting to talk, the works. I was so overprotective of him when Mr. T got back that it was hard to step back and remember "Mr. T is his Tatty" (that's Yiddish for dad). I had to let him be a parent, too. I had to let him be alone with him, play with him, reunite with him, and grow with him, because he missed so many milestones that he can't replay or re-experience. I keep thinking, despite the (regrettable, frustrating) distance Mr. T experiences with iBoy these days, at least he got those moments with him. He'll never have those with Ash. So letting him be a Tatty was one of the major things I had to really give into. But the little things, surprisingly, take a long time to get used to. I find beard hair on the counter and I think, "Well, I went nine months without that driving me nuts." It can be frustrating, but it also makes me smile sometimes because the reality is that it's those little things that make it all worthwhile, cheesy as it sounds. You decide which things are worth fighting for, fighting about, and getting over. One of the best things I learned in counseling from a rabbi, actually, and this really changed my perspective on how to make things work after such a great divide. And, honestly, it works for just about any major relationship. You have three Ls in a relationship. You have no fourth L, so don't look for it, don't try and find it, it doesn't exist. You can lobby for change, lobby for things to be different. If they don't or can't change, you move on to the next steps. You can decide to live with it (like the beard hair on the counter or the fact that my husband doesn't always put dishes directly in the dishwasher), or you can leave. It's as simple as that. I spent 12 of my 16 months of marriage the first time around looking for a fourth L. I was desperate for a fourth L. Had someone (like one of the two counselors I was seeing) given me this relationship map, I would have been able to make a better decision a lot earlier. It was only when I had lobbied and lobbied, lived with so much, and not found the fourth L, that I decided it was time to leave. This perspective has helped, a lot. It puts everything into perspective, and because I'm a planner, it allows me to look at every issue we have with a fresh perspective. 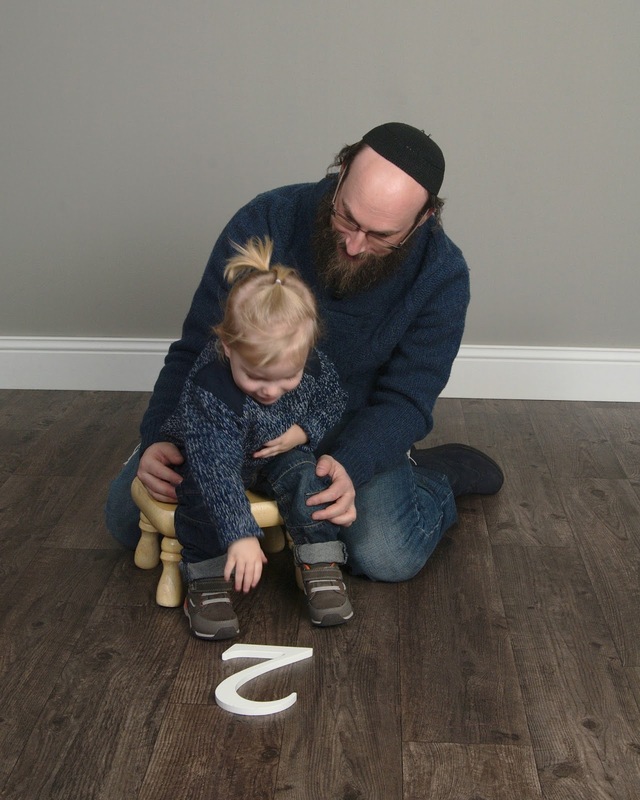 It's not easy, in fact it's been really, really hard since Mr. T got back, but seeing Asher light up when his Tatty comes home from work or watching him shove me back in the house on Saturday mornings when he and Tatty go to synagogue is so worth it. I'll admit it, I played the Powerball over the weekend and I'm probably going to play it again. I actually walked into the 7-11 last week, looked the woman working the counter square in the eyes, and said, "I've never done this before, can you help me?" I'm a 32-year-old woman who doesn't know how to gamble. This might not seem strange to 99 percent of you, but if you knew that my father has loved the lottery every day of my life, would that change things? I remember my dad's 40th birthday -- we got him these little bouquets of 40 scratch-off tickets. He's always played the Powerball, too, so I feel like I should have just known how it worked since I watched him play it so many times, choosing our birthdays as the numbers. But I blanked. The woman looked at me like I was nuts, too, which just made the experience all the more awesome. I had $2 in my pocketbook, so it was perfect. Did I win anything? Nope. Will I play again this week? Why not? After finding out just how much it's going to cost me to put both of my children in daycare in the coming year, I either have to win the lottery or cut food completely out of our diet. So, here's hoping HaShem is down with the Gordon-Bennetts this week. I have amazing earning potential in the U.S., and with my current work, I make a really good amount of money. But daycare and rent in the U.S. are murder. 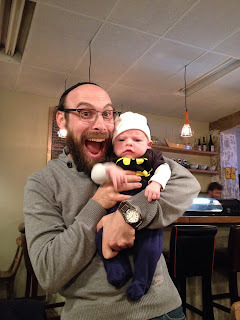 In Israel, daycare is crazy cheap (rent is still murder), but I have basically zero earning potential. So. There's that. Mr. T, too, is sort of in the same boat. His credentials don't transfer here, so despite the fact that electricians make a killing in the U.S., he can't work legally as a master electrician, so he's relegated to hourly jobs. We're also reaching a point where he wants to transition to something that isn't so hands on (too many bad bruises and injuries), but the question is: What? I probably wouldn't be so obsessed with budgeting and figuring out how to win $1 billion if I didn't have another parasite on the way. Oy! Why does daycare have to be so expensive, 'Merica? Note: From everything I learned, prior to purchasing a ticket, it's completely okay in Judaism to purchase one ticket, and one ticket only, and many say you shouldn't pick your own numbers, lest it suggest you're questioning the fact that HaShem runs the universe. So there you go. 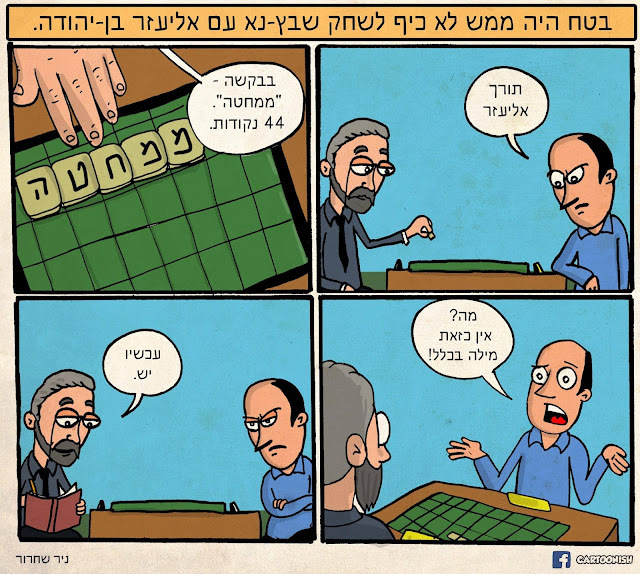 Scrabble with Eliezer ben Yehudah, anyone? Ah, Eliezer ben Yehudah, the father of modern Hebrew. My hero. I'll admit that his style of parenting was a bit bizarre. At a time when his version of Hebrew was not spoken widely, even semi-widely, okay let's be honest, no one really spoke it, he raised his son to speak only modern Hebrew. I'll be honest that my love of this linguistic genius arose during my time at Middlebury College when I was there for my intensive Hebrew ulpan during the summer of 2009, and every time I speak Hebrew I stop and consider whether it's one of his words. Top right: "Your turn, Eliezer." Top left: "Please, handkerchief, 44 points." Bottom right: "What? That isn't a word!" Bottom left: "Now it is." 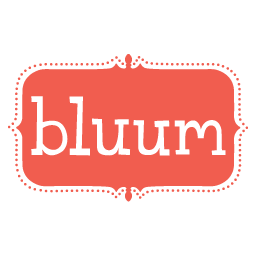 This blog began in 2006. I completed my Reform conversion in 2006. I graduated college with a bachelor's of journalism in 2006. So, I think, I'll just leave that there. No long, reflective posts about what happened in 2015, because I really just don't want to think about it, and no forecasting posts for 2016. I think I've finally hit an age where I'm not into resolutions for the secular New Year, and I'm not into reflecting on life and loss and triumph or anticipating those things in the new year. The only thing I can hope for in 2016 is that the world gets its #*!$ together and people stop murdering, hating, and judging one another. Just think, we're in 5776 right now, which means we're a mere 224 years away from 6,000, at which point, if we haven't gotten our #*!$ together, mashiach (the messiah) will be forced to show up for the Messianic Era. Now that's a real (scary?) thought.